In my darkest imaginings, I want one of those road-warrior laptops with a machined aluminum case about as thick as an in-flight magazine; a high-resolution display panel suitable for performing remote-control brain surgery; flawless surround sound through speakers slightly smaller than a quarter and fewer ports and interface devices than a toaster. Admittedly, such laptops have several drawbacks. They’re largely unusable – there’s not a lot you can do with no mouse, no CD-ROM drive and twenty minutes of battery life. They’re also preposterously expensive. The Inspiron 15 is something of a digital Volkswagen, and it’s a great computer to consider once you get your brain past the whole up-market credit-card bruising section of the computer isle at Best Buy. Attractive, not unduly weighty, nicely thought out and affordable, it’s a laptop that’s comfortable on jeans, rather than Armani trousers. There are buckets of affordable laptops at the moment. We usually lean toward buying Dells because we’ve bought so many of them in the past, and they’re all still working. This post was written on a Dell. We have a few Dells so old that Dell’s web page refuses to acknowledge their existence. The Inspiron 15 is made of black plastic, rather than machined aluminum, but it has a solid feel to it. At about six pounds, it’s not heavy enough to dislocate your arm even when it’s confronted with an airport concourse that spans several time zones. It has a full-size keyboard with really nice keys upon which it’s possible touch-type using your fingers, rather than a pencil. Its display panel is remarkably clear and bright. With three USB ports, you can plug a mouse into the Inspiron 15 – for those of us who are perceptive enough to appreciate that touch panels were secretly developed by invading extraterrestrials in the hope of driving us to the brink of madness and softening us up for conquest – and still have room for a flash drive. The placement of the Inspiron 15’s USB ports arguably constitutes one of its few lapses in design. Two of them are located next to the jack for its power connector. They’re sufficiently close that some slightly pudgy USB devices won’t fit in the port connectors if the power supply is plugged in. A few millimeters closer to the front of the case would have been decidedly preferable. Unlike many other comparable laptops, the Inspiron comes with a built-in SD memory card reader. While this was clearly intended to allow it to inhale digital camera images, it can be put to much more prosaic uses. Store your sensitive files thereon, and remove the card from the computer when it’s not in use. If someone half-inches your laptop, they’ll get your computer, but not your life. Our Inspiron came with Windows 7, which is a decided improvement over Windows Vista and a lot more difficult to use and frustrating than Windows XP. Some Dell laptops include the option to “downgrade” to Windows XP – sadly, this wasn’t one of them. Windows 7 is, to be sure, pretty to look at. We ultimately repartitioned the hard drive of the Inspiron 15 and installed an unused Windows XP license as an alternate boot. 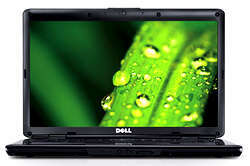 One of the laudable aspects of the Inspiron 15 is its heavy use of Intel’s chips – it has an Intel Pentium dual core T4200 processor running at two gigahertz, an Intel 4500 MHD graphics processor and Intel audio. Aside from just working well, Intel’s silicon is what software developers and driver authors and such usually test their stuff against. If it works at all, it should work on this platform. The XGA display panel of the Inspiron 15 is decidedly cool. It’s 15.6 inches corner to corner, with 1366 by 768 pixel resolution. It’s like watching everything on a personal HD monitor. Its aspect ratio being somewhat different than that of a conventional desktop monitor, it takes some getting used to. While WiFi connectivity has been improving a lot of late, the WiFi in the Inspiron 15 was impressive. Ours was able to lock down a solid signal well outside the building, at a distance that totally silenced devices built a few years ago. We ordered our Inpsiron 15 with a four-cell battery, which proved to be good for something over two hours of use. Six- and nine-cell batteries are also available for it. While the Inspiron 15 wasn’t wholly devoid of “crapware” – pre-installed demonstration versions, limited-time licenses and crippled software – there was a lot less of it than appeared on our earlier Dell purchases. We uninstalled fifteen months of McAfee’s Security Center in favor of Microsoft’s no-cost virus protection; a year of LoJack for Laptops theft protection – on the grounds that our Inspiron 15 lives in a locked room with a monitored security system and a hundred-and-fifty-pound dog in the hall; and a Microsoft Office 60-day trial. The Inspiron 15 did come with a fully-functional installation of Microsoft Works, which includes Word, Excel and PowerPoint. In use, the Inspiron 15 boots quickly, and is pretty well flawless. It doesn’t get warm enough to microwave your kneecaps, a decided oversight among many of its competitors. It’s stable even if it’s moved or bumped into. Ours hasn’t crashed once since we first powered it up. More so than most of the laptops we use, the Inspiron 15 lends itself to being forgotten about. You can switch it on and quickly ignore all the technology that’s screaming away inside it. Get some work done, watch a flick, stream some tunes or blow away an hour with one of the games you told everyone you uninstalled as soon as you got the machine. Never crack the Control Panel. One of our favorite aspects of the Inspiron 15, as with all the Dell computers we own, is that it was custom built for us, rather than being an off-the-shelf system from an electronics store. We got it with our choice of toys – and avoided paying for the ones we’ll never use – and with our choice of interior decorating. You can have the Inspiron in sinister black, or in a range of brighter colors, or with one of over two hundred a custom graphic case designs. The latter are a bit pricey, but some of them are serious eye-candy. There are innumerable comparable laptops available from other manufacturers, but we were unable to find anything that looked like a better value than the Inspiron 15. It does what its says on the box, does it without undue complications, and does it for a reasonable price. Given a choice between a computer that works and a computer that everyone you know will want to make off with, there’s a lot to be said for the former.